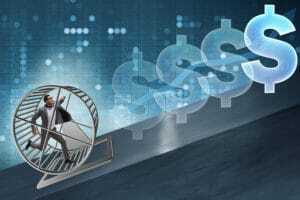 The premium domain hamster wheel will be in effect later this year. CentralNic is on a hamster wheel with premium domains. Domain name registrar and registry company CentralNic (AIM: CNIC) reported first half 2017 financial results today. The company reported first half revenue of £10.59 million, up 18.5% from £8.93 million in the first half of 2016. But this was down from £13.20 revenue in the second half of last year. While that might suggest the company is going to see a drop in revenue this year, never fear…CentralNic has a trick up its sleeve. It’s the premium domain hamster wheel. The reason CentralNic had a stellar second half last year was that it sold off some of its premium domains. One customer paid £3.555 million for premium domains. The good news is that the sale made CentralNic’s 2016 look good. The bad news is that CentralNic needs to repeat that performance with what is essentially an asset sale counted as revenue this year. Buyers: you’re in the driver’s seat on negotiations as 2017 winds down. This is a revenue game that a handful of public companies in the domain space play with premium domains. The problem is that once they book premium domain sales as revenue, they need to continually repeat the performance each year. Also, you eventually run out of premium domains to sell. CentralNic will also get a boost from running the .sk domain name. It expects that acquisition to close in September. It’s unclear to me how CentralNic’s underlying businesses are doing in terms of growth versus just adding revenue streams via acquisition. CentralNic’s wholesale business generated £1.816 million in the first half of the year. The company breaks out its top customers, with the top one generating £440k and the second just £50k. While I’ve always assumed these represent TLD companies such as XYZ and Radix, I can’t imagine its second largest TLD client (Radix) paid just £50k for the last six months. I’ve reached out to the company to find out if these customers represent registrars instead of registries. I’ve confirmed that these numbers are for registrars, not registries. On the new TLD front, CentralNic has renegotiated and extended its contract with XYZ through May 2032.